I want to download a bunch of videos from my cloud storage--is there a way to download them all at once? Yes! 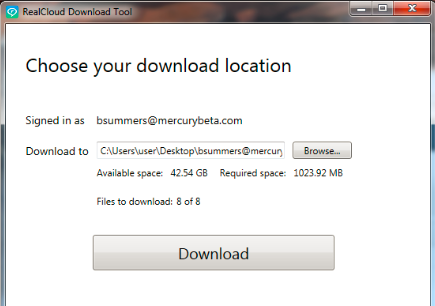 First, install our bulk download tool by clicking here. Follow your browser's prompts to complete the installation. Note: this tool can be used only on a PC running Windows 7 or higher. If you do not have a PC, you can download files one at a time on your Android or iOS device. 1. Sign in with your RealTimes login credentials. 2. By default, the photos and videos in your RealCloud will be downloaded to a folder on your computer's desktop. The folder's name will be your username. However, you can choose a different location for this folder if you prefer, by clicking Browse. 4. The tool will begin downloading all of the content in your RealCloud storage. (There is no option to choose specific files for download.) If the download is interrupted for any reason, simply open the tool again to resume the download--it will pick up where it left off. 5. When the download is finished, you can either close the window or click View Files to open the folder containing the downloaded files. Click Download, and follow the prompts. "Console is undefined" -- occurs for Windows 7 users on Internet Explorer 9. If this happens to you, try again using a different browser as your default browser to run the tool. Download button is grayed out -- Check your RealCloud storage space by signing into Account Settings; if the total storage is equal to the available storage, then you have no files stored in the Cloud, so there is nothing for you to download.